Oak Grove Furnace is no longer standing. 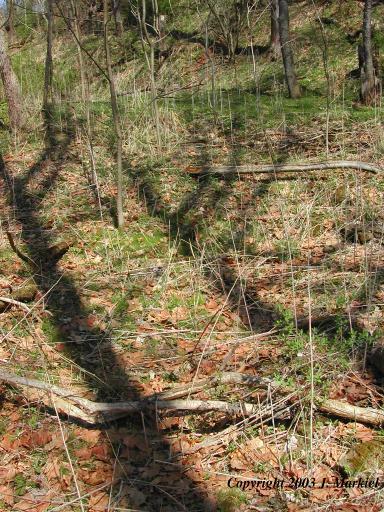 The picture indicates the area believed to be the site of the furnace based upon the directions given by Sharp & Thomas. I found extensive slag throughout the field between this site and the road. Take PA 30 to State Route 711 north. Make a left hand turn onto State Route 1017 (heading to Wilpen). Almost immediately after turning, you will cross a small stream. Park and follow the stream down the field - you will find the remains of a very old wagon path barely visible in the grass. The entire field is strewn with slag. At the bend of the stream, you will find the ruins of an old barn - only the corn shed remains standing. This is the reported site of Oak Grove Furnace.